1) Since incorporation in May 2012, the number of membership with voting right has exceeded 200 and well over 250 including family member’s spouses / kids and donation members. Their nationalities range over 15 countries. In 2014, the third year we will firm up the base of the organizational activities. The town committed to run for candidacy of hosting G8 Summit Conference scheduled in Japan, 2016. Japanese Government will finalize the host city after qualifying evaluation of candidates early next year. In September, World Amateur Team Golf Championship will be held at Karuizawa 72 Golf Course. International Golf Federation and Japan Golf Association will host 1,000 participants from 70 countries for two week period. At their request IAK will give voluntary service for the events. In September, International School Asia of Karuizawa (ISAK), an IAK member will start officially its school term with 50 first graders. IAK will cooperate with their activities as necessary. (Remark) Expenses of speak-easy, hiking, sports, Japanese lessons implemented by Friendship Div. and Support Div. are paid by participants. They will serve without remuneration. IAK’s internet transmission system got something wrong and found unreachable to many members only a week before May 17. We will re-check current communication means not to repeat such failure and to secure the quorum safely. The three participants enjoyed fine snow conditions, views and weather on 11th of Feb.(Holiday) at Asama Bokujyou Snow Shoes. 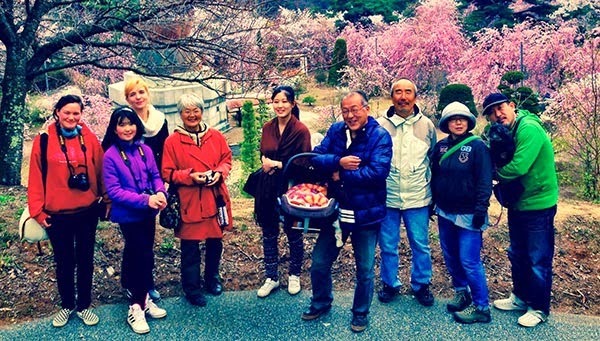 Ten participants hiked from Usui Toge along the border of Nagano and Gunma Prefecture to Ichinojiyama, Tomebuyama and Hanamagariyama on Sunday, April 29th. Despite the threat of rain, the cherry blossom party with 11 participants was a most enjoyable way to share our home-made picnic contributions and admire the blossoms at Shinraku-ji in Miyota on Sunday, April 29th. The 4th Local Volunteer Activity Fair by Karuizawa Welfare Committee at Chuo Kominkan was held Saturday, March 29th. Total number of participants were about 200 people. IAK opened an our own booth and 15 members joined it. Since Monday, April 21st Japanese beginner’s class are now being held every Monday. Three lecturers are teaching in turn from 10:00am till noon. Number of participants are 9 on an average. The topics are mostly about daily life like as reservation hotel, shopping, and etc..
Our meeting place for the afternoon chat salons held on the 2nd and the 4th Thursdays was moved from Komorebi-no-Sato to Chuo-Kominkan, or Multi-purpose room at Naka-Karuizawa Library. We are still not sure how to connect our chat to the discussion on IAK functions and its actual activities, but with pleasant presence of cute infants and their mothers we have been enjoying chatting about images of resort town Karuizawa, advertising methods being used in Shonan, impression of South-East Asia, examples of volunteer activities which have a great deal of impacts to town office, and collaborations with town tourism industry. 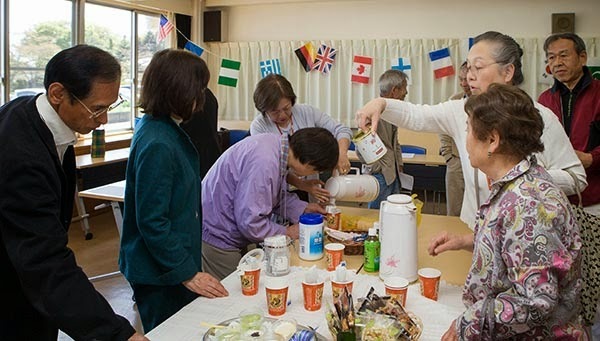 On Feb 10 Karuizawa Kindergarten held International Party among kids, teachers and parents. At request of Kindergartens P.T.A., IAK joined the event by sending the members to play the games with kids. The attendees enjoyed the party in the international circumstances. IAK will have the Junior IAK Program to offer such opportunity to younger generation and promote their international understanding. On Feb. 6, 2014, the 18 female residents (mostly housewives) gathered at the Assembly which was convened by Ms. Kimiko Shinohara, a member of Town Council of Karuizawa and the first lady chairperson. She planned and attempted to hold an assembly by inviting voluntary participants of women only and let them question their concern about living in town. The proceedings of the meeting followed exactly the same way as in Town Council. Mayor Fujimaki and a number of Town office staff attended and answered and commented attendees’ questions and opinions. Ms. Yasuko Shimizu, an IAK member joined as one of 18 participants to ask the question how the Town Office accommodated and controlled stray dogs and cats in Karuizawa. Other attendees raised many points concerning school education, social welfare, traffic etc. At present only 3 out of 16 seats are occupied by female members in Town Council. Ms Shinohara and two other members have been making efforts to encourage residents to increase up to 50% of the seats by offering such experimental event etc. Ms. Sayuri Kato, Vice Governor of Nagano Pref. was invited to join the meeting. Many listeners in the Council Hall filled up the seats, leaving some standing to show the women’s strong expectation and power to the town government. Later on May 12, the above attendees and Ms. Shinohara got together to discuss their points further and exchange information on any progress of the issues raised at the Assembly as time allocation on that day was limited to 20 minutes per person. They agreed the Assembly ended in great success with satisfaction. Ms. Shinohara showed her willingness to attend any upcoming meeting on request, why not with IAK. One year after retiring here, I attended the IAK General Meeting. There was a variety of people with different backgrounds, but they all loved the Town. At my first “Speak Easy” meeting, I was very nervous, but hosts like Tony and Garry welcomed me and made me feel at home. I quickly made several acquaintances and found myself enjoying life here more and more. IAK members hold a variety of opinions. Some feel Karuizawa should attract more visitors as a prime resort town, while others feel more tourists means more traffic jams and more development of land for houses which is accompanied by cutting down trees in a large scale, with the land cut into smaller pieces of lots for easy sale. As for me, I enjoy having a large shopping mall as an excuse to attract my children and grandchildren. On the other hand, it is so painful to see many grand old trees simply cut down. Now that the Town has passed regulations to restrict wild development, it should enforce it more thoroughly to protect the environment which is the core of the Town. According to the summer of 2012 survey of tourists to our Town, 70% return home on the same day, while 21% stay overnight. I believe that as long as the Town of Karuizawa emphasizes the image of “the Town full of trees with green leaves”, we can start by emphasizing the above “green” image by making improvements on the main street from the station to the Old-Karuizawa rotary with overwhelming abundance of trees as a symbolic street for visitors, rather than planting small maple trees along the street as they do now. At a recent “Speak Easy” gathering there was a discussion among some non-Japanese guests regarding the town’s medical service. It was unanimously agreed that having access to a local medical doctor who could communicate in English is vital. A foreign resident with a Japanese spouse can ask him/her to go along with him/her to the hospital, but it is rarely convenient. Those without a Japanese spouse often avoid the hospital because of the language barrier. The Town must address this issue if it wishes to be recognized as an international destination for non-Japanese natives. Perhaps it might be an idea for the Town to actively invite a nursery home which has facilities to accept such non Japanese nationals, and as a part of their service they hire a resident medical doctor who can communicate in English and provide medical service to non-native residents here as well. 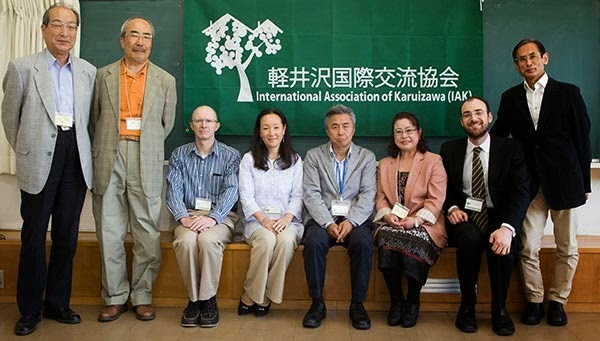 One year has passed since I joined IAK and I’m excited to consider all the possibilities with fellow members on how Karuizawa can become more internationally oriented. I look forward to continuing this dialogue with you all. Heavy snow storm in February caused late arrival of spring time to Karuizawa and we are now in fresh greenery. It is time that we will ask for your payment of annual fee (2014). Payment slip is enclosed to the member who will pay. 〒389-0111長野県北佐久郡軽井沢町長倉2141-428 0267-45-4101. Picture Window theme. Powered by Blogger.